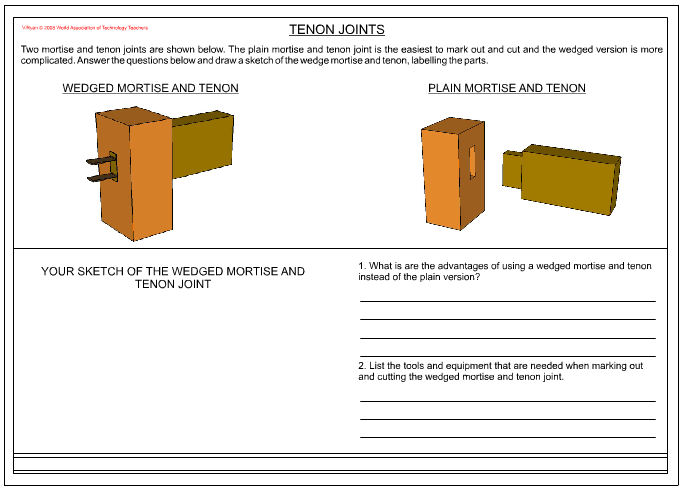 Below are two examples of ‘MORTISE AND TENON JOINTS’. These are used when making tables or cabinets and they are very strong when glued together with either PVA or cascamite adhesives. There are many different types of mortise and tenon joints. The Plain Mortise and Tenon joint (shown below) is very common and is widely used for the joints of tables. Although it is quite strong, if enough force is placed on the joint it will eventually break or come lose. On the other hand, the Wedged Mortise and Tenon joint is extremely strong because the tenon passes all the way through the mortise and is wedged at the other side. However, the Wedged Mortise and Tenon is more difficult to mark out and cut and requires much more technical skill. If the mortise and tenon joint is to used as part of a frame a secret or sloping haunch is used. The tenon does not show on the outer side of the joint and it gives greater gluing area, adding to the overall strength of the joint. The sloping haunch of the tenon can be clearly seen on the wedged mortise and tenon joint shown below. 1. Draw an exploded view of one of the mortise and tenon joints shown above. 2. Explain why the wedged joint is much stronger than the plain joint.